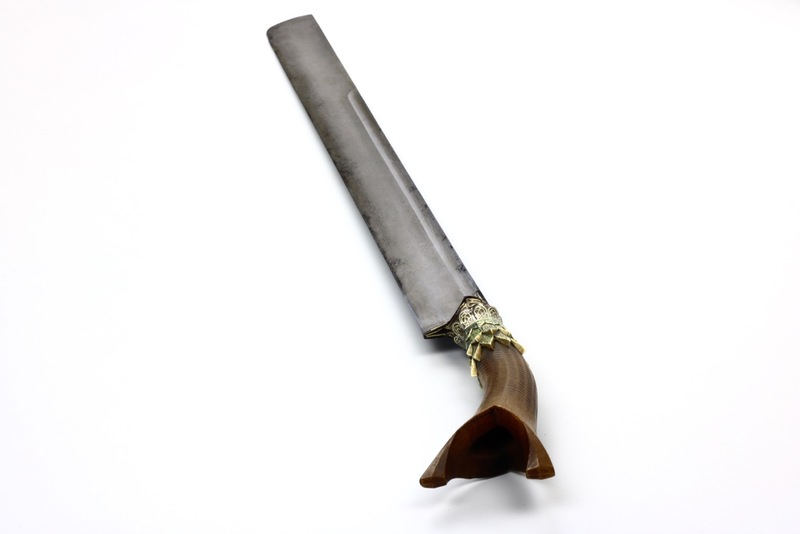 Materials: Iron, steel, horn, wood, gold, enamel. Dating: 19th century, probably before 1874. Provenance: From a Dutch private collection. A very good sikin panjang with three tiered golden crown. 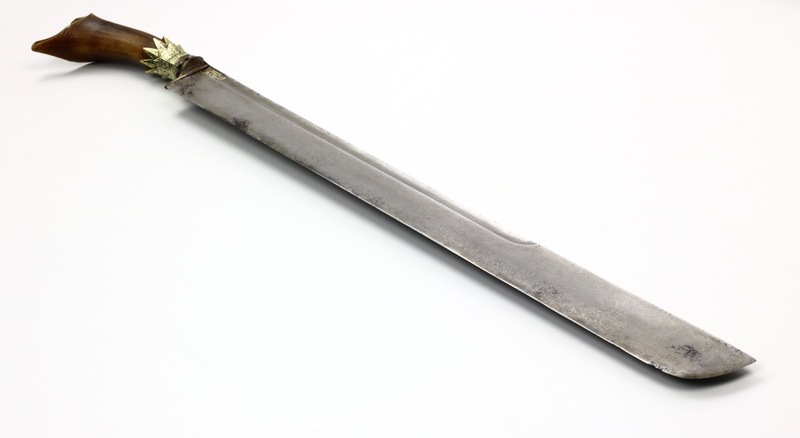 It has a straight, hollow ground blade with a single groove next to the spine of the blade. 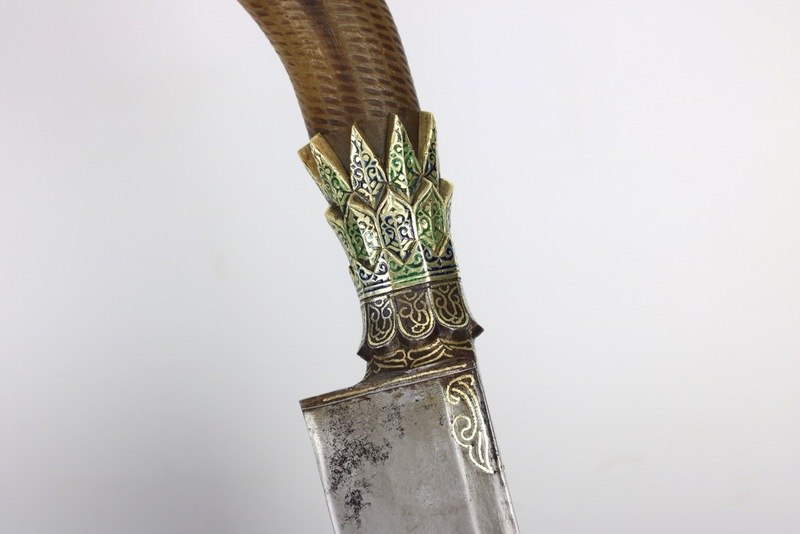 The blade is very well forged, exhibiting an active pattern of mechanical damascus steel. 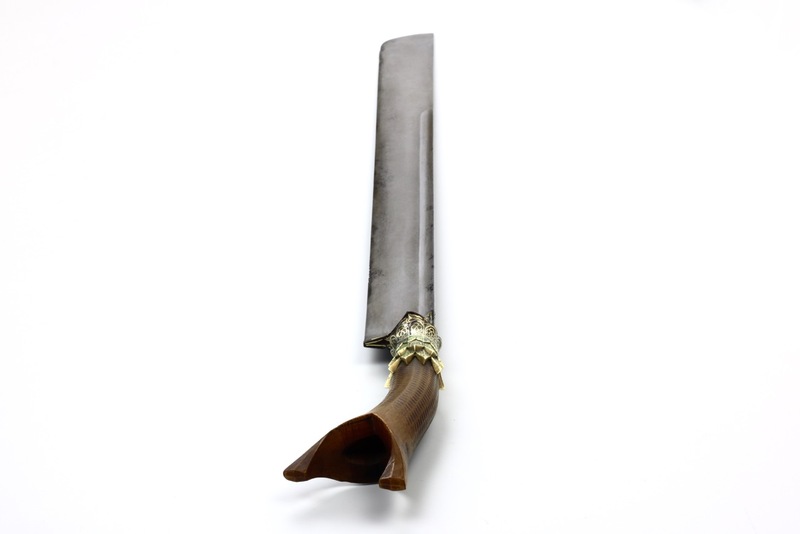 The handle is of light brown horn with typical forked profil. 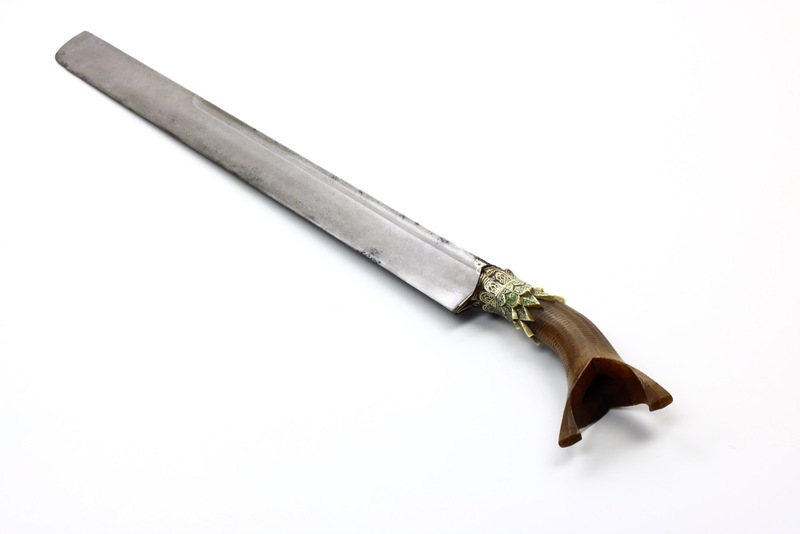 The handle is joined to the blade by means of a massive golden crown, called the glupa . This particular crown has three tiers, inlaid with blue and green enamel that contrast wonderfully with the gold. 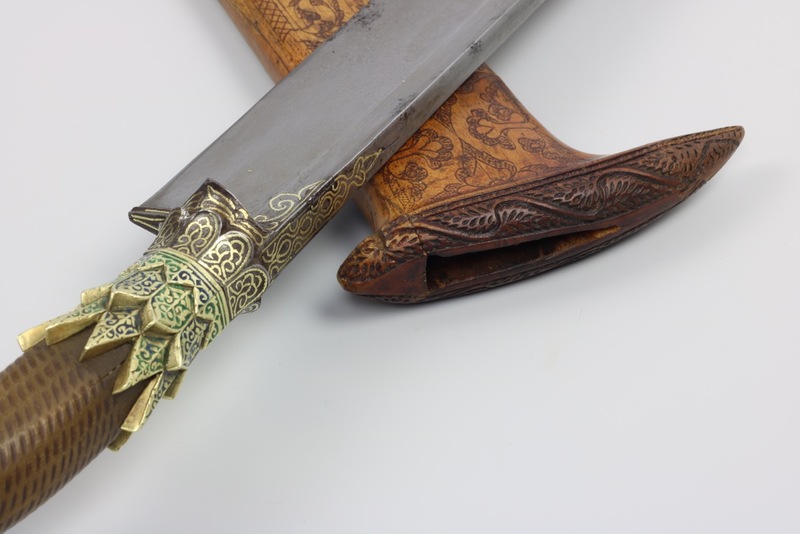 The base of the blade, both sides and back, as well as the steel bolster are inlaid with golden designs. 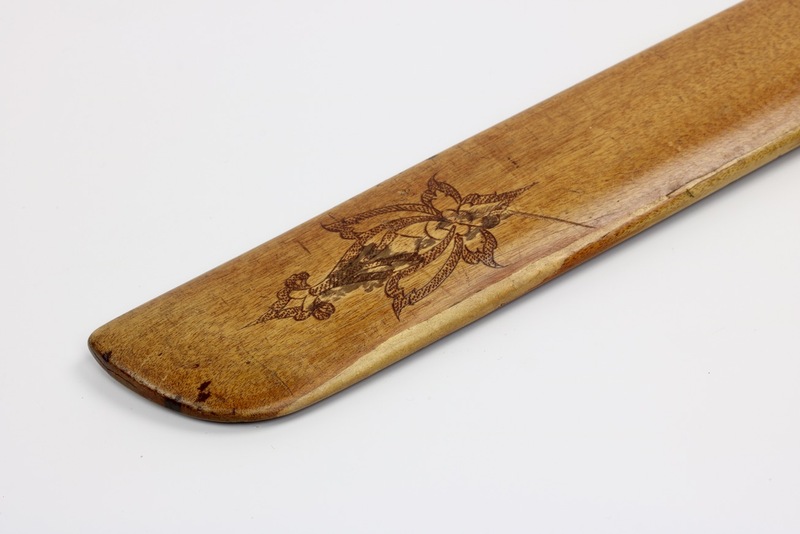 The original wooden scabbard is very well made, and still an excellent fit to the blade. 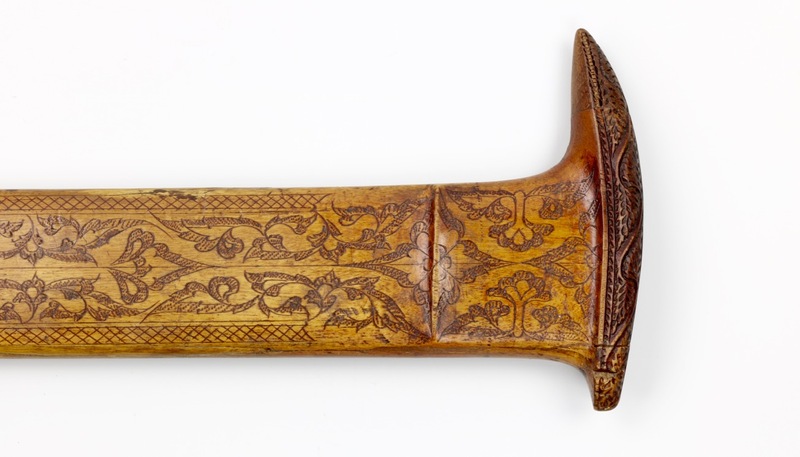 It is carved in the typical abstract floral designs of Aceh. 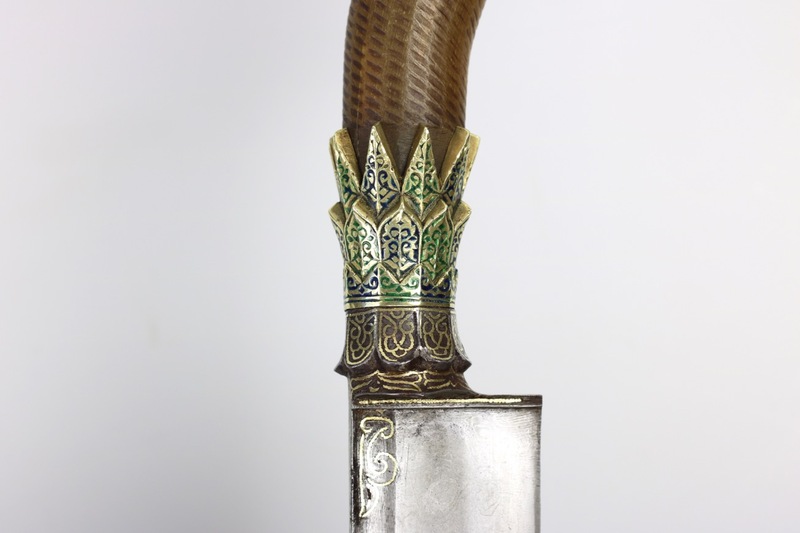 Some sikin panjang such as this example come with a golden "crown" at the base of their hilts, called glupa . 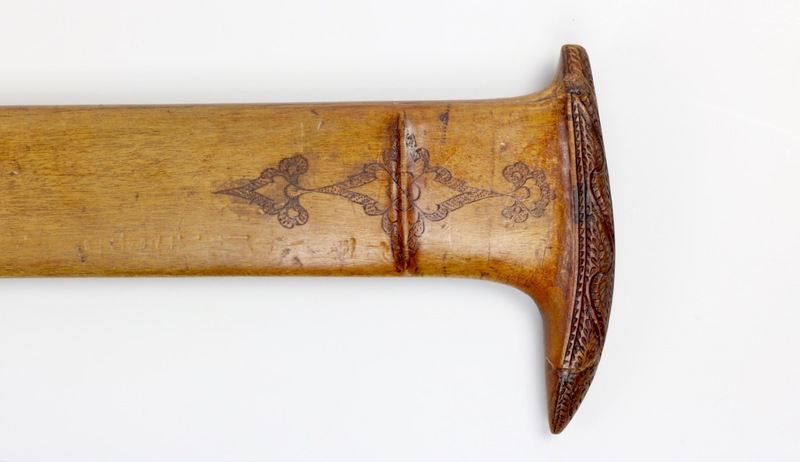 Such crowns are also found on another typically Acehnese weapon, the rencong . Both the sikin panjang and the rencong were presented by the Sultan to uleebalang (local lords) and other dignitaries. Simple versions were presented to panglima prang (temporary military commanders). Such glupa come with one to four tiers of "crowns", the number of tiers seems to have some connection with rank. The lowest rank to be allowed to wear sikin panjang and rencong with golden glupa are the panglima prang . Their weapons typically have a single tiered crown. 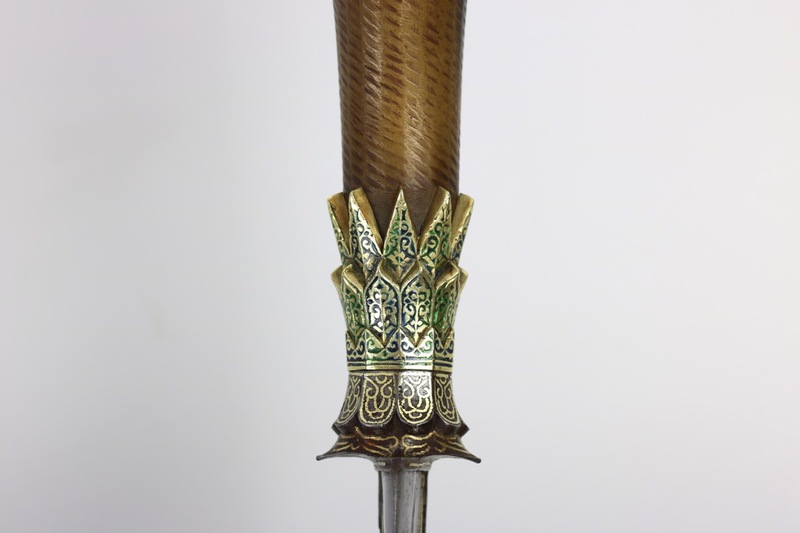 We know that the Sultan of Aceh had weapons with four crowns. That leaves ours just one step under the Sultan. It was probably made for an uleebalang or otherwise very important person. Some patches of deeper pitting on the blade, as is common on these. 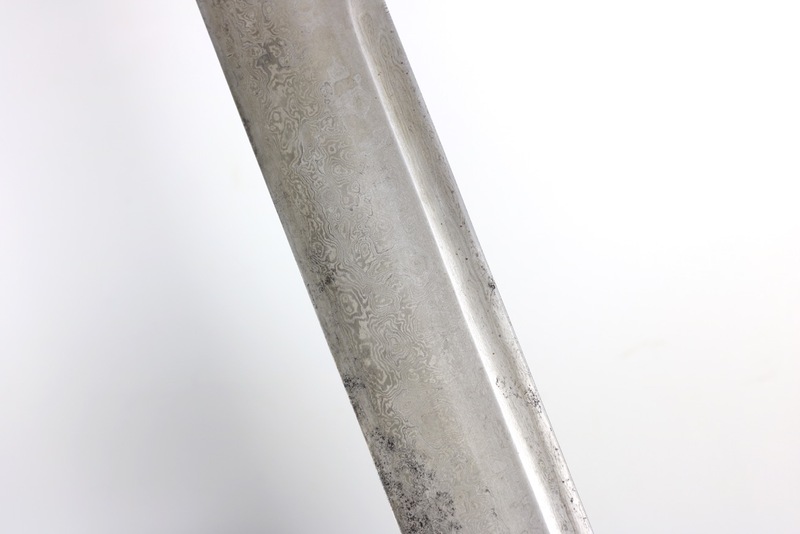 There is a small repair on the underside of the scabbard, a crack that was skilfully filled up. Otherwise in excellent condition. 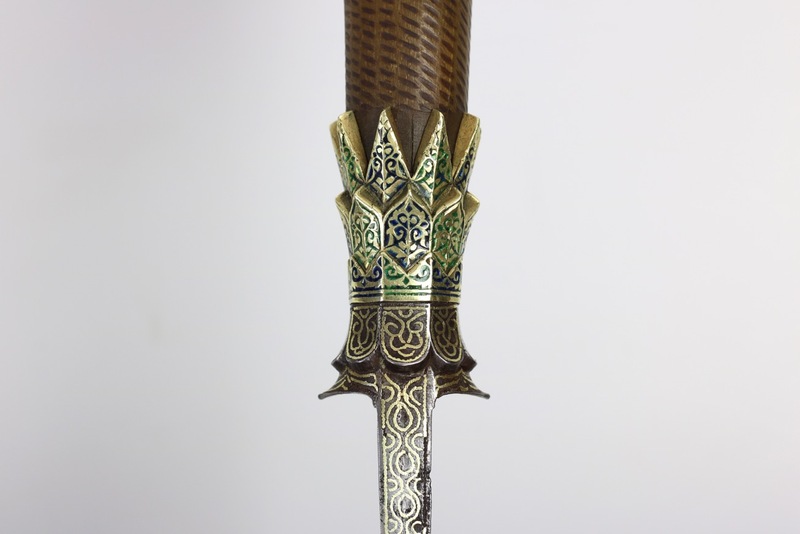 A magnificent Acehnese sikin panjang with very rare three tiered, two-tone enamelled, golden crown. This elaborate "crown" indicates it was probably made for a very important person. The pointy ends attribute it to the northeastern part of Aceh. 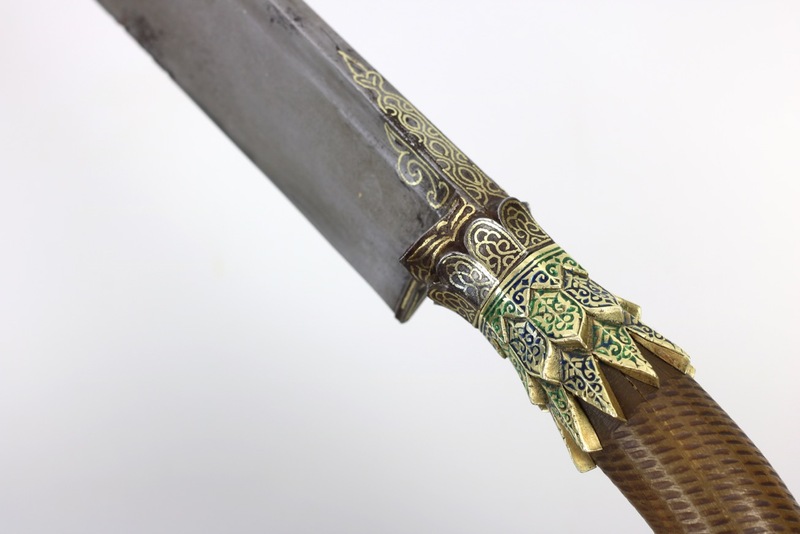 It is built around a top quality blade of fine mechanical damascus. 1. 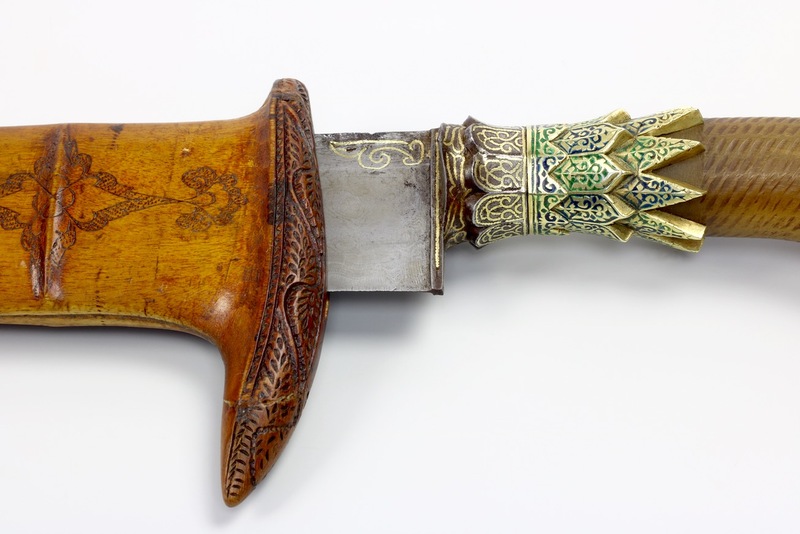 A. van Zonneveld: Traditional Weapons of the Indonesian Archipelago. C. Zwartenkot Art Books, Leiden, 2001. Pages 124-125. 2. An expert that prefers to remain anonymous. Personal communication.